Appliance manufacturers are always finding ways to improve those dreaded household chores – one of which is doing the dishes. The dishwasher with drawers is designed to pull out horizontally, with the aim to make it easier to load and unload dishes compared to the drop down doors on standard dishwashers. This type of dishwasher was first introduced by Fisher & Paykel – trademarking the name ‘DishDrawer’ – but has since been adopted other brands such as Kenmore Appliances, Kitchen Aid and Bauknecht. While there are other brands out there, Fisher & Paykel remains the only company to offer dishwashers with drawers in Australia. Read on for our guide to these dishwashers and what you can get from F&P. What is a dishwasher with drawers? A dishwasher in a drawer opens and closes in a similar manner to a standard kitchen drawer. There are single and double drawer dishwasher models, giving you the option to choose how much capacity your household requires. For small apartments, individual drawers should suffice, but for large homes, the double units stacked together might be a better choice. The double units are designed with each drawer independent of each other, which means different wash settings can be used on each load. You can also empty one drawer and fill the other even if one is already mid-cycle. The two drawers can also be positioned at bench height to minimise bending when loading and unloading. However, one of the drawbacks of the design lies in the dishwasher capacity. The lower height of the appliance limits the ability to fit large sized dishes, but as you will read below, Fisher and Paykel does offer ‘Tall’ models in its DishDrawer line to help reduce this problem. How much do dishwashers with drawers cost? 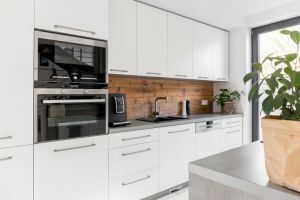 This type of dishwasher sits in the premium price range, with most models being priced between $1,000 and $2,000 as there isn’t much competition in the market. Typically, the price increases with the larger capacity dishwashers. Expect 3.5 stars and above for water and energy efficiency. 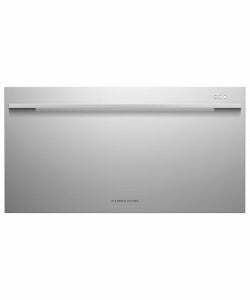 The Fisher & Paykel DD60SCX9 DishDrawer Dishwasher is equipped with seven place settings. It features six wash programs, including a quick wash and a delay start option. Most DishDrawer models along with the DD60SCX9 give you the option of choosing the Eco mode for all programs. It’s further boasted for the “Sanitise” wash modifier, designed to raise the temperature of the final rinse to a temperature that sanitises the dishes, targeting consumers who need to wash items such as baby bottles. The ‘Extra Dry’ wash cycle at the end of a program further aims to maximise drying, even on plastic dishes. 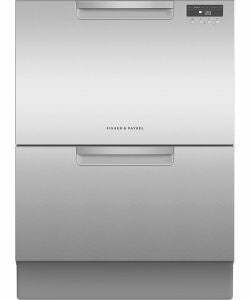 The Fisher & Paykel DD60SCX9 DishDrawer – as well as other models in the range – utilises Smart Drive technology, claimed to help conserve natural resources by only using as much water and electricity as is needed. 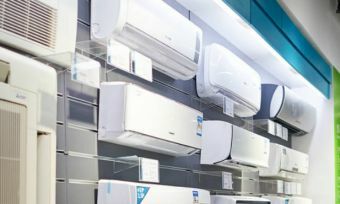 It has a 3.5 star energy efficiency rating and should add around $39 to your annual power bill, according to the Standard Test. In terms of water efficiency, it uses 3.9L per wash cycle and in turn has a 4.5 star rating. The design features a number of flexible racking options with a customisable cutlery basket for different utensils, as well as folding tines to accommodate large pots and baking dishes. It accommodates plates of up to 290mm in size, but the pitch-adjustable tines can slide out to be completely out of the way, if required. There are height-adjustable cup racks for different sizes as well as wine glass supports. Safety features include a fault indicator and a child lock. Noise level is boasted to be just 43 decibels. 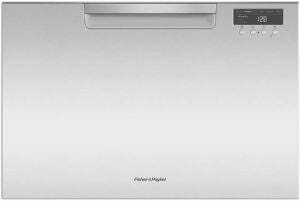 The Fisher & Paykel DD90SDFTX2 is a wider 900mm model, with nine place settings, more suited for a medium-sized household. It delivers nine wash programs to match including rinse, fast, delicate, normal, normal eco, and heavy, giving you the option to wash the fine glass as well as the heavily soiled pots and pans. Similarly to the model above, it allows users to customise internal shelves to fit your full load in. Other common features include a child lock, fault indicator and a delay start option of up to 12 hours. With its slightly taller height dimension than the model above, it can accommodate plates up to 315mm in size. It has three stars for energy efficiency, using 197kWh/year, and four stars for water efficiency with 9.4L of water usage per wash cycle. According to the Standard Test, it should add around $56 to your power bill for the year, based on 28.7 c/kWh. It also produces a slightly louder noise level of 49dBA and is only available in a stainless steel colour variant. 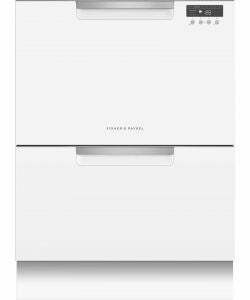 The DD60DAX9 DishDrawer Double Dishwasher is in Fisher & Paykel’s premium selection. The double drawer option is boasted for being able to wash one drawer and stack another. It features no less than 14 place settings, with its internal racking being foldable to fit larger dishes. Typically, it accommodates plates up to 290mm. It’s equipped with six wash programs, including a fast wash and an Eco mode. Expect similar features to the previous models such as a child lock, diagnostic indicator and a delay start option. It has a 3.5 energy efficiency rating using 136kWh/year. In terms of annual running costs, it could add around $38 to your electricity bill per year. Furthermore, it uses 6.9L of water per wash cycle, which gives it a 4.5 water efficiency rating. In terms of noise levels, it’s stated to produce 44dBA on a standard cycle. The DD60DAX9 is available both in stainless steel and white (DD60DAW9) colour options. For a family-sized dishwasher, you might like to opt for the DD60DCX9 DishDrawer. It features 14 place settings and 15 wash programs, including three wash modifiers with quick wash and extra dry options also available. It’s equipped with flexible racking similar to other Fisher & Paykel models and has each drawer working independently to the other, to allow you to select two different wash programs. This model is further boasted for the ‘Sanitise’ mode, which is claimed to kill 99.9% of bacteria. In regards to noise levels, the DD60DCX9 is measured to produce 43dBA during a standard cycle. It has a 3.5 energy efficiency rating and can add around $38 to your annual electricity bill. To make use of the off peak energy tariffs, you can delay the start time up to 12 hours as well as turn off the end of cycle alerts to not disturb you during the night. Its water efficiency rating is similar to the others in the range – 4.5 stars out of six. Some of the accessories included are two cutlery baskets, kick strip, knife clip and multipurpose clip. You are also able to choose a height between 820-880mm to fit your kitchen bench dimensions. It’s available both in stainless steel and white (DD60DCW9) colour variations. Should I buy a dishwasher with drawers? 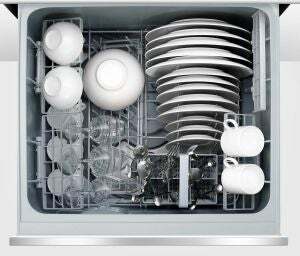 Dishwashers with drawers are designed to be flexible, compact and ultra-space-efficient. Single drawer dishwashers allow you to load the dishes from the top, being easier on the back. For double drawers you can install each drawer side by side for better reach, instead of one being stacked on top of the other. For most small kitchens, a single drawer dishwasher should be large enough to suit your needs. You can run smaller loads – more frequently – and most models boast fairly quite performance. However, larger households may require greater capacity, which double drawer models provide. The added advantage of having two drawers is that you can run two different wash cycles at the same time. For example, you can run a delicate cycle in the top drawer for your wine glasses and a heavy cycle in the bottom drawer for the large pots and pans – all at the same time!